Twenty years after her delivery, the iconic superyacht Ronin has completed an extensive one-year refit at the Lürssen shipyard in Rendsburg. This atypical 58.5m superyacht has warship-like design by Sir Norman Foster with naval architecture by Gerhard Gilgenast allowing high performances; her twin 5,875hp MTU engines provide a top speed of 30 knots and a range of 3,500 nautical miles at 18 knots. This is one of her most major and extensive refits since her launch in 1993. It includes a 10-year ABS survey but also many modifications. Outside, a cork underlay was installed under a new teak decking, composite works were done on foredeck storage boxes, wing consoles and tender cradles, a new sun awning system with carbon poles was installed on the sun deck and the bridge deck and Ronin was entirely repainted. Inside, 50 per cent of the interior was dismantled to remove the old AV system, including old cables. A new state-of-the-art AV was installed, plus phone and camera systems. And in the technical areas, pumps, valves, generators and engines were completely overhauled. A new cooling plant was installed also, as well as new shaft bearings and the propulsion received a complete realignment. 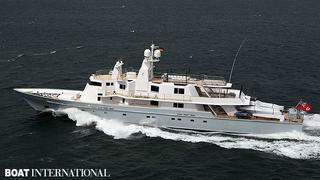 Arriving in Germany in September 2012, Ronin was re-delivered a few days ago.